Republican Senator Lindsey Graham said on Sunday President Donald Trump should meet Prime Minister Imran Khan as soon as possible to reset long-difficult US relations with Pakistan and push for a peaceful settlement in Afghanistan. “I’ve seen things change here and all in a positive direction,” Graham, a member of the Senate Armed Services Committee who has generally been a staunch supporter of Trump, told a news conference in Islamabad. He said a meeting with Khan, who has declared strong support for a peace agreement in Afghanistan, would leave Trump ‘far more enthusiastic about the region than he is today’. “With Prime Minister Khan we have a unique opportunity to change our relationship,” he said. A previously transactional relationship, based on rewards for services rendered, should be replaced by ‘strategic engagement’, including a free trade agreement, he added. The US senator met Prime Minister Imran Khan earlier in the day, where he lauded the Pakistani leader’s vision for political resolution of the Afghan issue. Imran Khan told Senator Graham that Pakistan wants to work with all stakeholders for the Afghan peace process. While speaking to media, the US senator said Chief of Army Staff General Qamar Javed Bajwa has given a dinner in his honour. He said he will apprise the US president of these meetings. He said whatever Pakistan Army did in 18 months has been the US’ wish since 18 years. Senator Graham said the US cannot move away from Afghanistan as it has a lot to do here and that Pakistan installing border fence is a positive step. He said the US has been mistaken to continuously change its policy vis-à-vis Pakistan. Prime Minister Imran Khan reiterated his government’s commitment to continue working with the United States and other regional stakeholders to find a political settlement in Afghanistan. He also underscored the need for normalizing relations with all the neighbouring countries to unleash the potential of regional cooperation. The prime minister said his economic team was constantly striving to evolve business friendly policies for potential investors which could be benefited by the US companies. 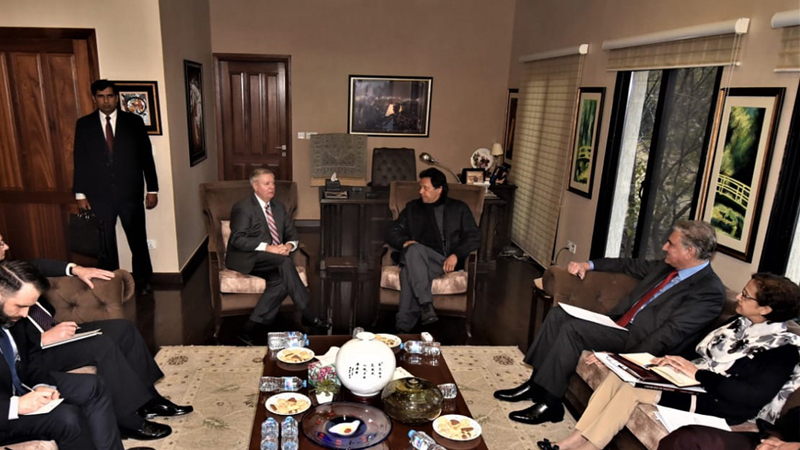 Senator Graham lauded the vision of Prime Minister Imran Khan to improve the economy, eliminate corruption and create jobs for the people of Pakistan. The prime minister’s efforts to normalize relations with neighbouring countries were noteworthy, he added. Khalilzad left Islamabad without announcing a new date for talks with Taliban representatives, who have refused further meetings until the US side agrees to discuss a timetable for withdrawing its forces. The uncertainty has increased by reports that Trump is prepared to order more than 5,000 US troops out of Afghanistan, a move that would represent a sharp change in course from Washington’s previous policy of stepping up military action against the Taliban. With Afghan forces suffering thousands of casualties a year and struggling to hold back the Taliban insurgency, the reports have caused alarm in Kabul, prompting many close to the government to question the US commitment to Afghanistan.